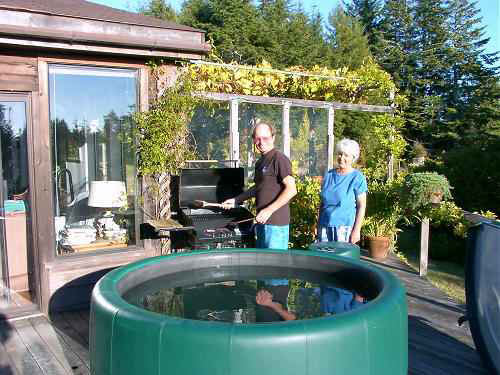 Our home is located on the spectacular Mendocino Coast 150 miles (240 km) north of San Francisco. 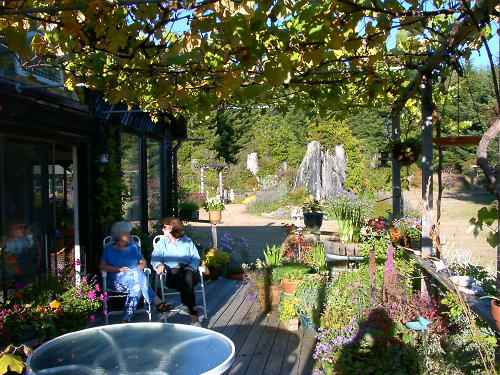 Our 13 acres (5+ hectares) of gardens, meadows and redwood forests are situated in a beautiful ridgetop rural neighborhood just 1.5 miles (2.5 km) from the Pacific Ocean on a quiet, dead-end, paved road with horses and llamas grazing in neighboring meadows. We are 5 miles from the fishing village of Albion, 12 miles from the historically preserved coastal village of Mendocino (an art, wine and food lover's delight), a golf course, wild & beautiful beaches, and 3 rivers for swimming, canoeing & kayaking. We are 20 miles from Fort Bragg's harbor, ocean fishing and whale-watching cruises, the historic Skunk Train, many Anderson Valley wineries, and two virgin redwood preserves. Here are seven PHOTOS of our property, inside and out (click on a photo to enlarge it). 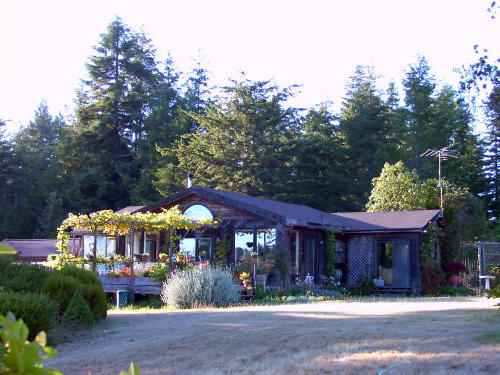 This first one shows our home set amongst lawn and gardens with the Douglas Fir & Redwood forest as backdrop. Next is an interior view as we enter our living room. 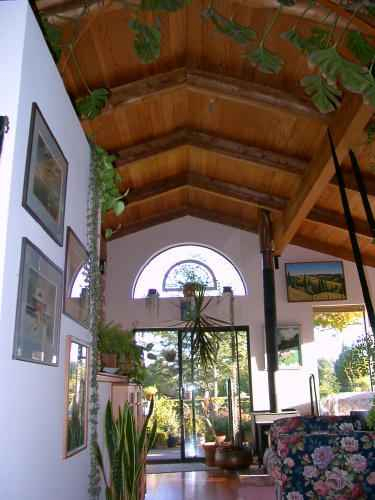 We designed and built this home about twenty years ago, using Douglas Fir for the floor and ceiling and Redwood that we cut and milled on our land for the posts, beams and rafters you see holding up the roof. 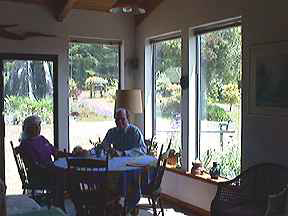 The first photo here shows our dining area, with complete kitchen to the left and great views of the lawn, garden and forest out the sunny east and south facing windows. The middle photo shows our living room. 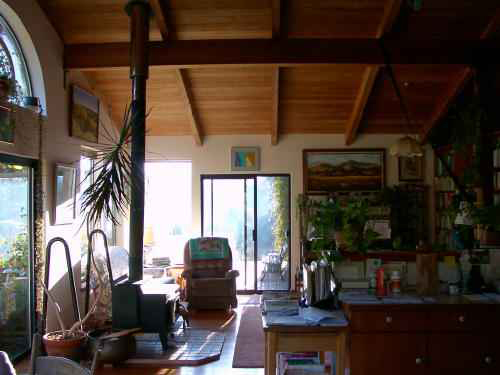 The living room features a wood stove with glass door, two couches, a recliner and south and west facing windows. 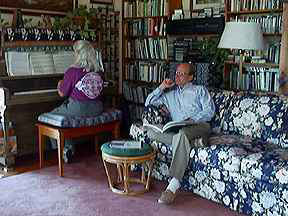 The third photo shows a cozy corner that features a six-foot couch, piano, library and entertainment center with stereo, tape cassette & CD player, and video & DVD player (but no cable or broadcast TV reception). Our home has two bedrooms with queen beds, two bathrooms, a pantry/laundry, an office, a 4-car garage and nearby guest cottage (described below). The first exterior photos shows our hot tub and BBQ grill which live on our west deck, while the second photo shows our south deck. Our south deck houses a lush, grapevine-covered container garden, outdoor dining area, and views of the lawns, gardens, forests and distant ridge. We are situated in a quiet rural area with no roads or other homes in sight. Deer, turkeys and other wildlife frequent our meadows, and at night what you usually hear most is the distant ocean surf. Because Tom is allergic to animal dander, we cannot exchange into a home that has pets that come indoors, and we cannot allow pets into our home or cottage. Also, we are non-smokers and ask guests not to smoke in our house or cottage. This cottage is new, clean and quiet with a queen bedroom, tub & shower bathroom, full kitchen, sunny deck, and a comfy, sun-filled living room (with 2 optional additional single beds). We use this cottage for guests, for home exchangers, and we sometimes rent it out by the weekend or week. 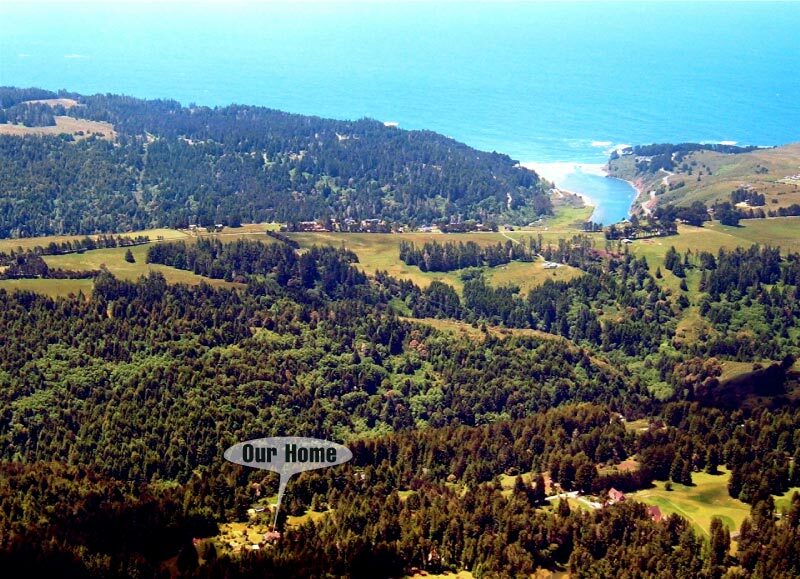 To learn more about the Mendocino Coast area, click here and here.